A pilot and his eight passengers were killed when their small plane crashed into a remote Alaskan cliff on Thursday afternoon. 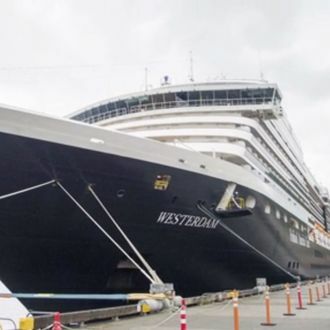 The passengers were all tourists from a Holland America Line cruise ship, the Westerdam, which docked in nearby Ketchikan, Alaska, earlier in the day. The flight was a sightseeing trip operated by a local airline, Promech Air, and booked through Holland America. “Officials tracked an emergency locator transmitter that was activated in the vicinity of Misty Fjords National Monument,” the Alaska Dispatch News reports. Helicopters located the aircraft “800 feet above Ella Lake against a granite rock face” in “an area of steep, mountainous terrain.” So far, heavy winds have prevented recovery crews from accessing the site, though they hope to reach it sometime on Friday. “It’s kind of hanging on the side of the mountain. The floats, of course, are broken off and it’s actually (lying) on top of the floats with the tail hanging out over about a 30- or so foot drop,” explained rescuer Jerry Kiffer. “There was no immediate indication of why the DeHavilland DHC-3 Otter turboprop went down,” the Associated Press reports. The National Transportation Safety Board is assembling a team to investigate the wreck.